The shoulder joint is a ball and socket joint with an extensive range of motion. Our ability to move our shoulder in many different directions allows us the ability to feed ourselves, ride our bike, dress ourselves, do hand stands and brush our hair. The down side of this increased mobility is decreased stability, which makes this joint more susceptible to injury. Your doctor may request imaging studies to determine the extent of your injury and to determine if there is soft tissue damage. The treatment of your shoulder pain depends entirely on the cause of the problem. It is critical to seek care and understand what is causing your symptoms before receiving treatment. Chiropractic care helps restore the health of your spine and neck which could reduce or eliminate your shoulder pain. The nerves that innervate the arms and hands exit the lower neck and go through the shoulder. 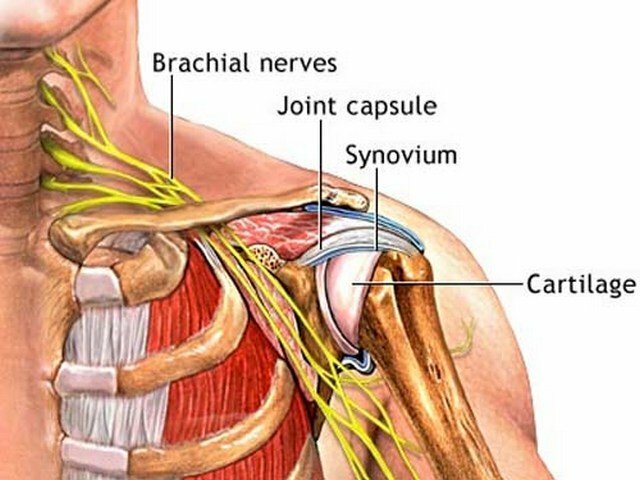 Impingement of these nerves can cause shoulder pain. Chiropractic adjustments can help restore alignment, improve mobility, and relieve pain and stiffness in your body. Depending on your condition, moist heat, ice packs, massage, stretching and strengthening exercises may be complimentary to your care.